Today's simple pleasure was inspired by fellow blogger Fiona of How to be Chic and her post that challenges you to actually do the little things you want to do that fit your most ideal chic lifestyle. While it is true that I already take time to enjoy simple pleasures on a daily basis and these are decisions within a framework of how I want to live, her post still inspired me to pause and brainstorm for experiences and then prioritize them. Her writing led me to ask myself, "What do I really want to do?" rather than my usual thinking of, "What haven't I written up as a SPS post yet?" Usually, as an INFJ, I'm all about analyzing the big picture! Her post also served as a reminder that I could make it happen. Sometimes, I have to plan more than simply buying something at the store. I often serve a large board of antipasti when I entertain. Plus, I will frequently have a bit of cheese, a carb and maybe some charcuterie accompanying a glass of red wine to snack on after work or while cooking dinner. But, I adore antipasti for a fun meal for myself. Rick Steves calls himself "a picnic connoisseur" and promotes picnicking as a cultural and economical way to experience Europe. This traveler relishes picking up picnic supplies from the local market. I have taken his advice and memories of picnics in the Tuileries Garden in Paris are among my favorite of the trip. Mr. Steves enjoys picnics so much that he also creates them at home. I rarely transform antipasti into a bigger lunch or dinner just for me, but should meal plan for it every once in awhile in the future. This is today's antipasti lunch. 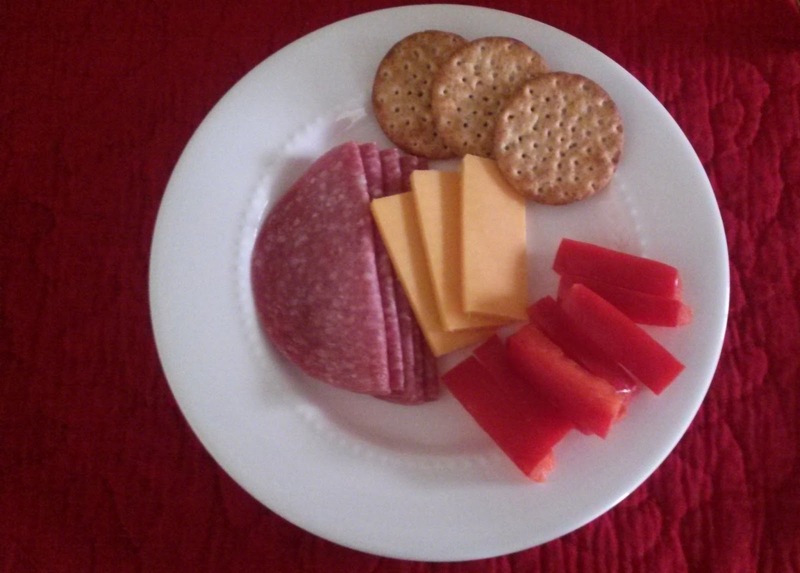 It features cheddar cheese, Toasteds Harvest Wheat crackers, Genoa salami, and my favorite vegetable, red bell pepper. This is actually my poor version of antipasti. It is certainly a cheap meal. The salami was on sale. The meat and cheese are both store brand. I would have preferred prosciutto but that would have cost a bit more for half the amount of meat. Another vegetable would have been nice. Ideally, I would have also traded the crackers out of my pantry for good bread. I have it on a small salad plate in order to keep my portion size in check (as I am trying to lose a little weight). Perhaps I will publish a rich version of it here on the blog or as an extra on Instagram. Anyway, I enjoyed my little lunch. Furthermore, I look forward to this quick and easy meal that means so much during the rest of spring and throughout the summer. Red peppers are my favorite too. :) When I want to splash out on a picnic style snack or meal, I get a baguette or demi baguette, toast it and spread some brie on it, with a glass of red wine....yum. That's a good idea! I usually don't cook/make much for my simple antipasti, I just arrange, but I could prepare bruschetta or other crostini, roasted red pepper or other roasted/grilled vegetables, and cold pasta salad. That's so nice! :) I could see me doing that with a future husband! You should try a recipe for caponata, Giada had a good one and the ingredients are affordable. You can use it on crostini and then use the rest on pasta. It would be a nice addition to your antipasto platter! I love your antipasti lunch plate Michelle! I sometimes have this kind of plate for lunch too. Thank you for a wonderful post. I love the way you write - your sweet sincerity shines through.